Stay up-to-date with the latest SEND developments, have your say in surveys, check out up-coming ways to provide feedback and see how parents, carers and young people with SEND have been participating in the co-production of Cornwall’s SEND Local Offer. For previous updates in a downloadable PDF format, please scroll to the bottom. Caudwell Children (Charity) allow families to apply for up to 80% towards the cost of a piece of equipment if there gross household income is less than £45,000, excluding benefits. Have you seen the latest issue of Kids to Adultz magazine? 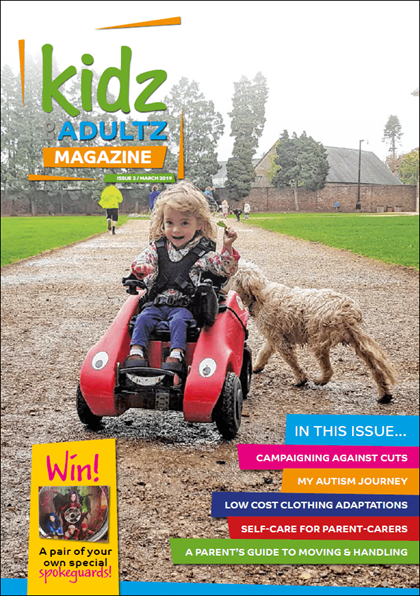 The second issue of the new Kidz to Adultz magazine is now online to read after being distributed at the Kidz to Adultz exhibition recently. Why not take a look now. And if you have a story that you think should be in a future issue, why not get in touch. Contact, the charity for families with disabled children, have developed the Helpful Guide for families with disabled children. Packed with all the essential information the parent of a child with additional needs or a disability might need, the Helpful Guide is designed for all families with disabled children, but it’s particularly relevant for families early in their journey. Contact also offer a helpline for parents and carers in any part of the UK with a disabled child aged from birth to 25. As part of its research, Ambitious about Autism is keen to hear from families of young children with an autism diagnosis, or suspected diagnosis to understand their experience and identify the gaps in access to early years support. You can complete the University of Warwick’s online survey here. Mother’s Day Quiet Hour @ LUSH Truro: Make your own Bath Bomb! Have a concessionary bus pass? You can travel at any time on Cornwall’s buses from 01 April! The previous restrictions meant that the pass would involve a charge if used before 09:30, this has now been removed, allowing users of the pass to travel for free at all times of day. Read more on the Cornwall Council website. Take part in the Healthy Parent Carers programme. "Do you live in or near Dawlish, Minehead, St Austell or Bideford? Have you heard about the Healthy Parent Carers programme? Do get in touch if you are interested on 01392 72296. It's FREE to take part." Newquay is the first airport in the UK to be Makaton friendly! More than 70 staff working at Newquay Airport have been having lessons in the sign language Makaton to help disabled passengers. Makaton is a form of communication that uses signing and symbols to support speech. It is believed that Newquay is first Makaton-friendly airport in the UK. The Makaton Charity, which promotes the language, said it hoped other airports would follow Newquay's lead.